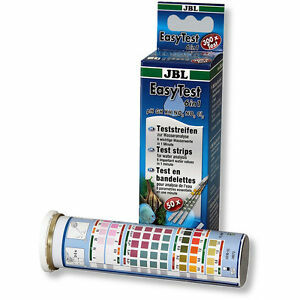 Ensure that your water is healthy and free from nitrates by using this JBL EasyTest Kit. Each of these strips tests 6 different parameters at once, saving you time. They help you maintain the quality of your water by providing you with information more quickly than a liquid test would. This is ideal for checking on water acidity, pH stability, and poisonous nitrogen compounds after a tank has already been installed. 0,00 GBP de frais de livraison pour chaque objet admissible supplémentaire acheté auprès de pro-shrimp.